Cameras will be clicking this weekend, forever capturing the moments when their children turn into ninjas, princess, superheroes, fairies, monsters, witches, and a multitude of other personalities. Growing up, my sister and I did not have many store bought costumes. Usually our outfits had been meticulously crafted by our mom and Nanie, and they lasted a lot longer than the store-bought plastic capes. Halloween, if anything, only proved that Disney’s reach was not limited only to our afternoon cartoon selection, weekend excursions, and stuffed animals. In the fall of 1989 my sister donned her princess persona. She couldn’t pin down one princess in particular, so she simply took on the overall air of royalty, which was not entirely a stretch for her. Standing alongside her, I gleefully pulled on my buckskin buccaneer outfit. The only items that had been purchased for the costumes were my sister’s scepter and crown together with my coonskin cap (a Walt Disney World acquisition, coincidentally). 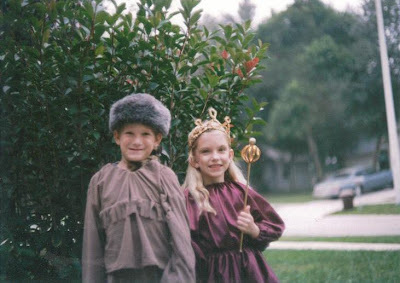 Davy Crockett and a princess, could you find a more Disney set of siblings on Halloween? I think not. The Davy Crokett outfit not only served its purpose on Halloween, but I can recall it being so comfortable that I wore it as pajamas until I hit my next growth spurt. HAPPY HALLOWEEN! BE SAFE EVERYONE! And I love the picture - that is awesome! And your sister looks very regal - she could fit in with my Royal Family!